Tucked away on gritty Princess St and across from Parsi Dairy Farm is one of my favorite book stores: Gita Press Ki Dukan (Bookstore of the Gita Press). See, I came late to this genre of Hindu scriptures. Educated in a convent school, I drank deeply of the Kool-Aid that western writers were the axis around which the Universe rotated. We studied Browning, Byron, Keats and O’Henry, and passed on Dnyaneshwar, Eknath, Kanaka Dās and Tukaram. I knew more about priests and nuns, and zilch about Alvars and Nayanmars. Romeo & Juliet was a Classic, Ramayana a myth. We doted on Shelley, Hemingway and Shakespeare, but skipped Tulsidās, Mirābai, Tyāgarājā and Kālidās. I knew more about St Peter than Bhagwān Ādi Shankarāchāryā or Swami Madhvāchāryā. Thankfully I graduated and real education could begin. A tiny booklet of Swami Vivekananda’s lectures bought at a railway station was the spark. And what a roaring fire it kindled. Was engrossed in it for days. Followed hungrily by the Bhagavad Gitā, Upanishads, Purānās, commentaries of various masters and Bhakti poetry. I had just scratched the surface. Years ago, I came across a dusty copy of Gosvāmi Tulsidās’s RāmCharitaMānas. More than a retelling of the Ramāyanā, Gosvāmi Tulsidās had brilliantly condensed most of our scriptures into this one classic. You study this one classic and you understand them all. Each word of each couplet is exquisitely sculpted; placed there with purpose. Will take a lifetime to study. And the beauty of his verse leaves Byron in the dust. Now I await every opportunity to attend discourses on RāmCharitaManās. 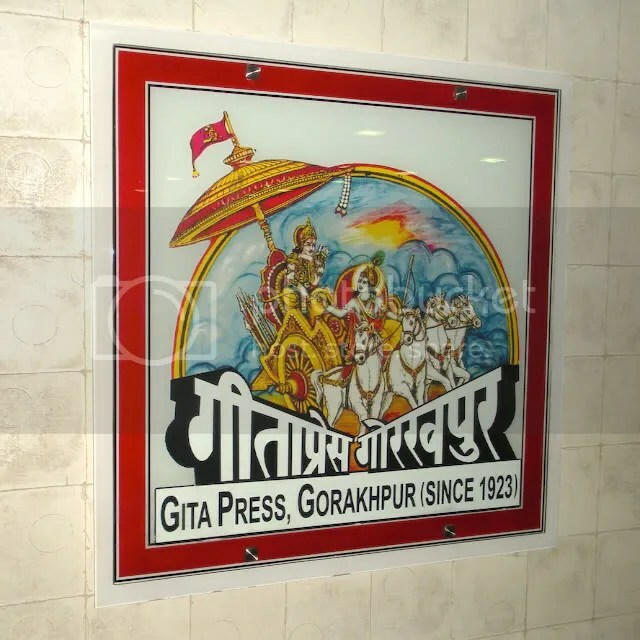 Some of the best translations of the RāmCharitaMānas are published by Gita Press, Gorakhpur, UP. 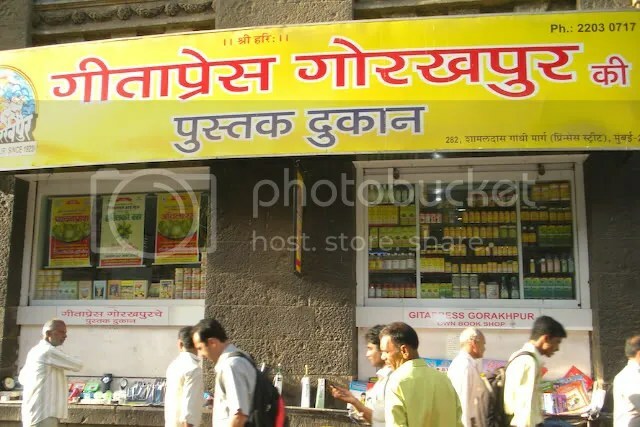 Imagine my delight that the fabled book publisher had an outlet near our home in Colaba, and as a bonus, it was across the street from Parsi Dairy Farm, the best place for mithai. I was expecting a drab, dark store, with shelves buckling under dusty tomes. What a surprise to find this posh marble floored, air-conditioned shop. They sell just about every Hindu scripture: Vedas, Upanishads, Puranas, works of Saints to compilations of bhajans. And these beautifully bound books were jaw droppingly inexpensive. A hard bound copy of the Devi Mahātmyan (Greatness of Devi) was Rs 80 (~ US$ 1.60). 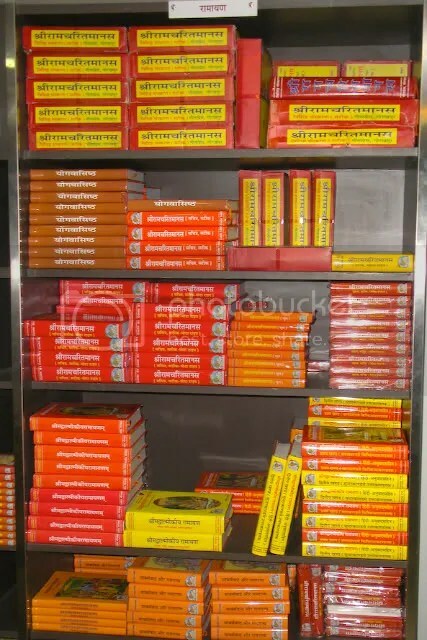 Bhajan booklets were Rs 2 – 5 (4-10 cents). On my first trip I bought so many volumes, I had to take a cab home. Hum yahan kaam nahin karte, yeh hamari seva hai. We don’t work here; this is our service. I was speechless. This was the pure essence of the Bhagavad Gitā and mouthed so simply by these uneducated, laborers. I nodded incredulous. In the Bhagvad Gitā, Prabhu Sri Krishnā painstakingly explains the essence of devotional service (inspired activity or Karma Yoga) to an impatient Arjuna. Renouncing attachment, steadfast in your duty, engage yourself in inspired activity, O Dhananjayā! Labor performed solely for wages is far inferior than inspired activity performed with steadfastness of purpose. Seek solace in inspired work; for wretched is the lot of those who labor solely for wages. What Sri Krishnā explains, these unschooled laborers live out. They understood the essence of Karma Yoga, practiced it flawlessly and succinctly expressed it in words. 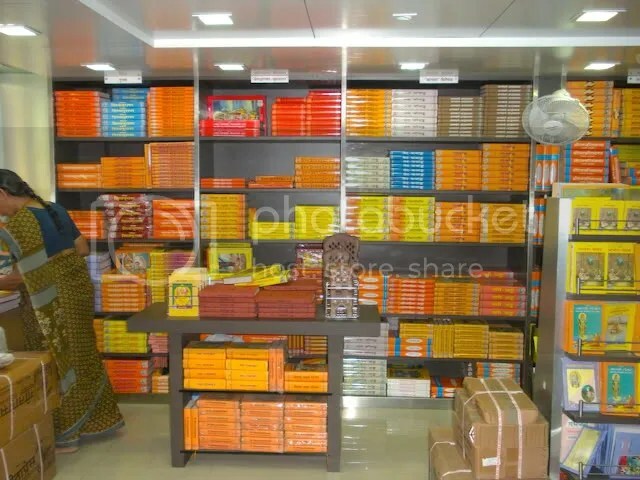 When you do visit Gita Press Ki Dukan, certainly pick up the tomes, but pause to chat with those working there. From them you will learn the essence of all those volumes you labor to bring home. This on the Bookseller in Goa. You can download many complete manuscripts in PDF for free, including the complete RamCharitaManas. some reference as to where I may get to read it again . Keep up the good work Arun . Sorry, I just wrote this article. You need to contact the store directly and they may be able to mail the book to you. I am not familiar with the 115 Shlokas of the mahatmyam, but perhaps other readers may be able to help.